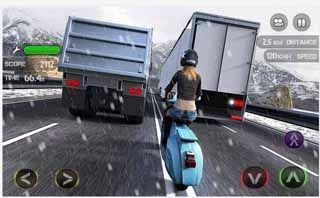 Free download Race the Traffic Moto for Android with APK latest version. Race the Traffic Moto takes bikes games to a whole new level. Have fun dodging cars and trucks while you speed up to the limit. Race against the AI in an outstanding Racing Face-Off and try to earn the respect of your fellow bikers. Enjoy the fun of driving the most amazing bike models in the world. You can get some custom bikes or even some older classics. Lots of bike racing fun.